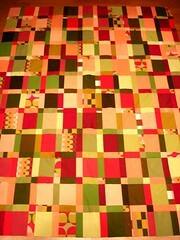 As in Quilters Unlimited of Northern Virginia - is having a quilt show this weekend! I am going on Saturday. Wanna join me? Even though it is a "local" show, it is big & nice. But the best part, I get to go to a favored grocer - Wegmans after the quilt show. Are they in your area? If so check them out. & don't let anyone tell you differently! I have been lurking in her blog/flickr for quite a while - Happy Zombie - what's not to love. Well one thing to love for sure is my new magazine.... Her quilt is on the cover! And the Mimi tales... 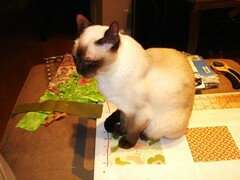 I almost had to go out & get a toy sewing machine... Come on there is a cat on it! Go check out Happy Zombie - you'll be glad you did, but grab a cuppa first! Another picture & pattern for purchase seen here. Another pattern for purchase and teh look that is similar to what I am going for can be seen here. 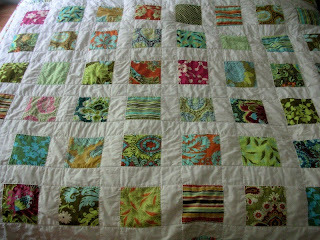 Very interesting article on log cabin quilts - courthouse steps being a variation on that theme. 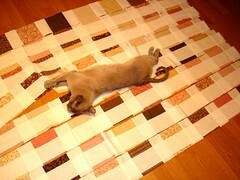 I use quilting a delaying tactic. I need to write a critical review essay of a scholarly article. After purchasing, washing & pressing a bolt of Kona Snow on Saturday, I pieced these two quilt tops. Freshcut & Pink & Brown squares. 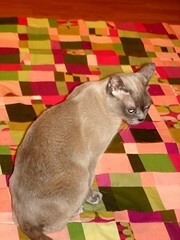 Rhapsody my Tonkinese cat on Freshcut. 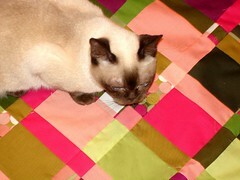 RB my Tonkinese cat on Pink & Brown. when I went in to cut some more Kona Snow. I wrote a rough draft of the essay long hand last night - now to type it & send it through the style writer. In my neck of the woods, Memorial Day (Only An American Holiday?) is the official start of summer. The pools open, the BBQs get going, schools out, etc. With that said, I doubt that I will be on line for more than a quick read of e-mail in the mean time, so Enjoy the holiday if you celebrate it. Enjoy the weekend at any rate! 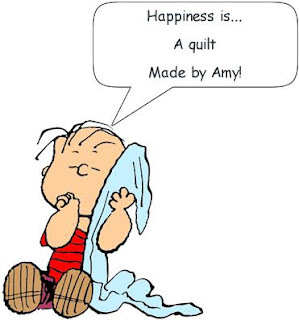 Have a safe celebration & I hope you get some quilting done - I plan to! 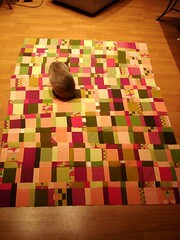 The current quilt requires a border. Nothing fancy but a border nonetheless. 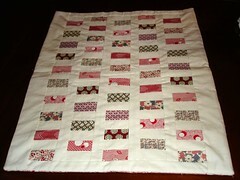 I pieced it up to the "time to add a border" point last night. Sorry it is a gift, so no photos will be forthcoming. Man injured when hit by quilt - or maybe the translation is "off?" 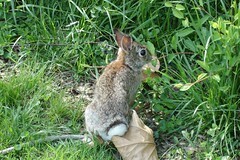 These are the pictures from this morning - I had to run home to get my wallet - so I grabbed the camera! 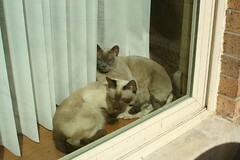 My other model, Rhapsody a Tonkinese cat. The photo with my cat shows truer colors. I also got some serious work done on a baby quilt. :o) I hope to get that done this weekend. After I get the Kona Snow & I jumping into Freshcut! You will recall, that I made this top, "Plain Spoken" (from the book, "The Modern Quilt Workbook" by Bill Kerr & Weeks Ringle) using this selection of solid cotton fabrics. 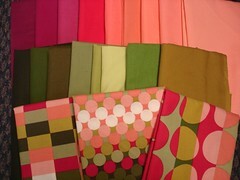 And you can see my inspiration fabrics as well. BTW adding in the inspiration print to the original quilt was my first plan for the first "plain spoken" quilt - I am glad that I did not do it - but I am happy that I did do it on the second quilt. I ran into this blog. So my rationalization is to share the blogs that you find. Can you use a giggle? Check out this vacation adventure. Is there anything more pretty? Many of you know that I am a student at American University in Washington, D.C. these lovely flowers are on the other side of the road out side of the parking lot. As I go into the building where my class meets (Ward Circle Building) if I look over my back, I see these... 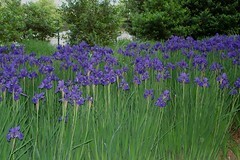 I liked them so much that I walked by them on the way to my car after class last night. 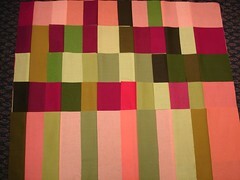 The edited in part: I just made this comment on Laura's blog... "The Kaffe quilt that I described in my blog today, reminds me of raindrops - maybe that is why I want to make it - or is it the tear drops?" The tear drops would fit my current mood... Would/Could a $100 worth of fabric cure my mood? You know with either I'd be satisfied with a small charm (of each). 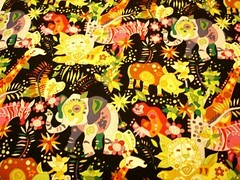 The is her "focus" fabric. 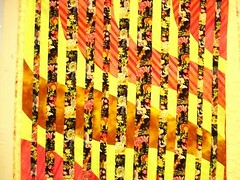 Here is mine - an Homage to The Great Barrier Reef. I knew that I wanted to do an "arty" quilt for the Great Barrier reef... That got cemented when I found the Hand dyed fabric about a year ago... I have been planning on doing the Convergence quilt for the past year, too - but I never got around to it - you have to clean off a good space literally and time wise... So when I saw a slass was being offered I signed up! Last night since the table in my stewdio was still cleared and my big mat was out, I decided to cut the background for a quilt in progress... Instead of 3.5 inch strips, I cut the 3 inches... So I trimmed the I Spy's accordingly! It will still work. I guess that proves that I need the TV on to quilt! FYI - I got a B in my Statistics class (YAY! - Huge sigh of relief!) & my next class starts tomorrow night - something about healthcare administration... That was one bit of good news that I have been needing! I started working on Plain Spoken again. 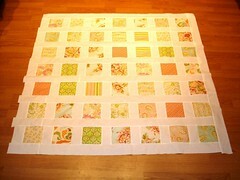 225 of these blocks are now sewn into rows. I'd like to share a secret about my method. 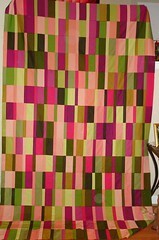 For this sepcific quilt you see several different greens, peaches, and berries. It may not be as apparent, but there are also two different widths of rectangles. 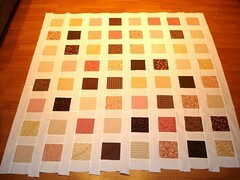 So I cut the two different width in strips for strip piecing. I should not have fat quartered my half yards first - but I did & it is working out fine - I just have scraps that I can not justify tossing... Then I sewed skinny to fat randomly, trying not to duplicate my strip sets or to create opposites. ( did not want light skinny peach with light fat green & then light skinny green with light fat peach - ya know what I mean? Then I sub cut. Then I stacked trying very hard to not have any like colors touching in the stack. If the first block was light peach and light green, the next block could not have either light peach or light green. So that when I got to the part that I did last night - sewing the blocks into rows - I would have the individual fabrics separated. I do have chunks of green, but not chunks of light green. Now for the "design floor" portion of my method. I will layout 2 rows and try to make sure that the same skinnies or fatties are not next to each other - again greens can touch, I just do want light green to touch light green. I continue with that method until I have all of my rows in pairs of 2, then I try again making groups of four rows, etc. So far using this method, I have been fairly successful. I hope my morning ramble was at least entertaining... A peek into the mind of a crazy lady. 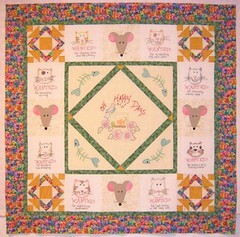 Here is the doll quilt without the doll. 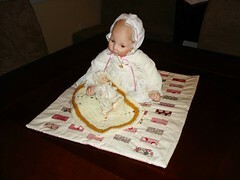 Made by Maitreya as part of Doll Quilt Swap 2007. 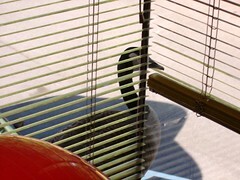 In the mean time, take a look at who is visiting my office. He left when I tried to lift the blinds. 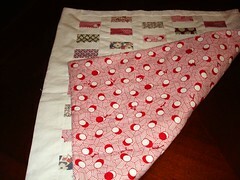 My doll quilt(s) were recieved! See them here: Mama Urchin. cleaned: a goodly amount - did you notice the friends over note, ahem. watched TV: too much (as always) but the cats were so comfy on their mommy's lap. 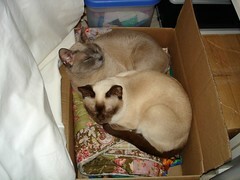 slept: late - see the note about the cats & add a good dose of "we needed it." napped: often - I am blaming the cats for that one too. studied: some... NOT NEARLY ENOUGH! Over at "I knew that" there is a list of participants... Can I admit that I have been staking the blogs to see who got what & eliminating them trying to figure out which lovely will grace my doorstep then office wall! & I have been checking to see if mine has arrived and the response... NERVES - yes, ladies and gentlemen my nerves are shot! Purple (again) & the stashbuster topic of the week. 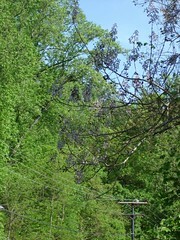 More wisteria can be seen at black berry creek (lovely photo, BTW). Meanwhile, I drove to American University to work on my statistics group project & took the Macarthur Blvd. 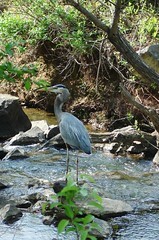 along the Potomac River to Loughboro Rd. in Washington, DC route, so I was able to pull over safely for these photos of my mystery purple tree. To give you a sense of their height - note the electrical poles in the background. close-up of the blossom - no leaves yet. 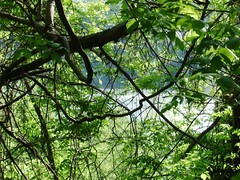 This one shows how you see the purple/blue against the green leaves of the other trees. So you can see that it is not wisteria - a vine. 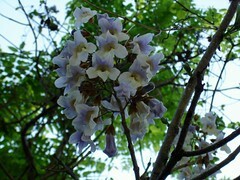 & I doubt that it is Jacaranda either... (everything that I have read has the Jacaranda's growing in a different region, i.e. Southern California... & besides these purple mystery trees are not messy.) 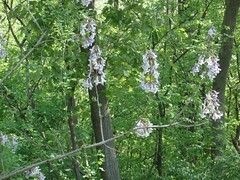 Does anyone know what this tree is called? The Potomac River. In the fall, I answered a meme that asked about something that suprised me... As you can see the river is hidden behind the spring leaves - in the fall after the leaves fall, you can see the river without having to get out of the car and zoom in on it - so it is a suprise in the fall eventhough you know it is there all along. 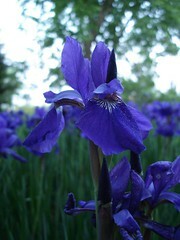 So I was on a mission to find and photograph those purple flower in trees. I am not convinced that they are Jacaranda & I wanted to photograph them so that someone in the know could say yay or nay. I saw them on the highway - not the best place to be taking photographs... I took the long way home - around the mall - nothing. I went for a walk, with my eyes in the sky. While I did not find the elusive tree in a photographable location (I'll try again tonight - I'll be on a less traveled road.) 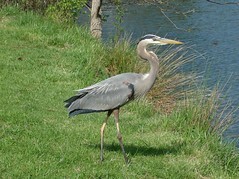 I did see more wildlife in suburbia.